Looking for a new bike? 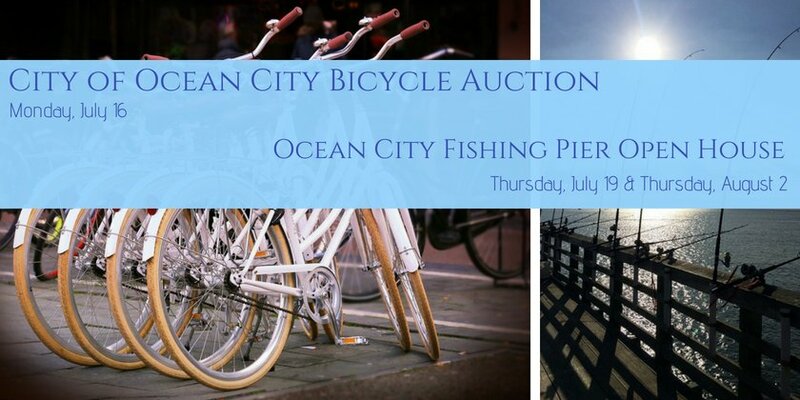 You may find one at the Ocean City Bicycle Auction taking place today, Monday, 7/16, from 10 am – noon at the Shelter Road Vehicle Compound (first left off of Tennessee Ave., behind the golf course). Bid on over 100 unclaimed and abandoned bicycles and other items, such as surfboards and kayaks. Registration begins at 9 am and a driver’s license, passport or valid I.D. is required. All items are sold “as is/where is”, with no warranties applied or offered. Bank checks with I.D., traveler’s checks and cash only will be accepted. The rain date is Tuesday, July 18th. For more information call 609-525-9356. Later in the week, if you have ever wanted to tour the Ocean City Fishing Club’s pier and clubhouse at 14th St. & Boardwalk, you’ll have your chance. On Thursday, July 19th , from 6 – 8 pm, and again on Thursday, August 2nd , the pier will be open to all. This is a great photo taking opportunity! The club will be accepting canned good donations to support the Ocean City Food Cupboard. For more information visit here.